If your kiddos are up for a challenge, then have them partner up and see who can use the most words to make a complete sentence! 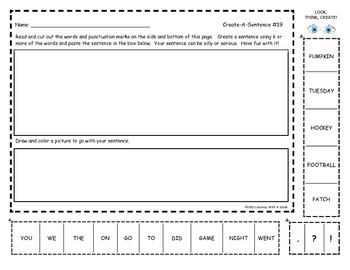 In this 50 page activity packet, children must cut out the words and rearrange them to make a sentence. Several different sentences may be made from the words provided. 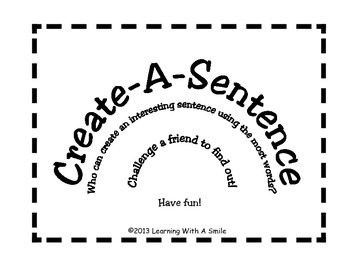 Students may make silly or serious sentences...it’s up to them. It’s lots of fun and this activity truly gets young minds thinking! My students get so very excited when they create a great sentence. And that makes ME very excited!! Uses: pair-and-share, small groups, whole groups, independent practice, homework, literacy centers, and more!